As an up-and-coming engineering firm in San Antonio, KFW Engineers + Surveying contracted us to do a total rebrand of their company. Being one of the fastest growing engineering companies in the city, they wanted to have an updated brand to accompany their new office building that was going to be built. However, once we had presented them with the new brand, they opted not to wait until their new building would be ready and implemented the new look right away. What started out as a logo design consult, ended up as a full-blown rebrand for one of the fastest growing engineering firms in San Antonio. Working together with the team at KFW, we came up with multiple concepts and color schemes that we presented to their leadership. After some tweaks and feedback from them, we were finally able to settle on this finalized design. We wanted to update their previous serif-based logo by creating something that was truly custom - not just simply a font. We also created a brand standard guide that included the proper color schemes, logo variations, and fonts to use so that they could maintain the brand level that we had created for them. This company was moving up as one of the more elite engineering firms in the city so we wanted to make sure that they represented themselves as such. The logo’s negative space subtly portrays the silhouette of the historical North arrow that is used in all engineering drawings. Similar to their drawings, the integrated North arrow represented their professional services as a guide to consistently lead their clients in the right direction and establish the proper heading. 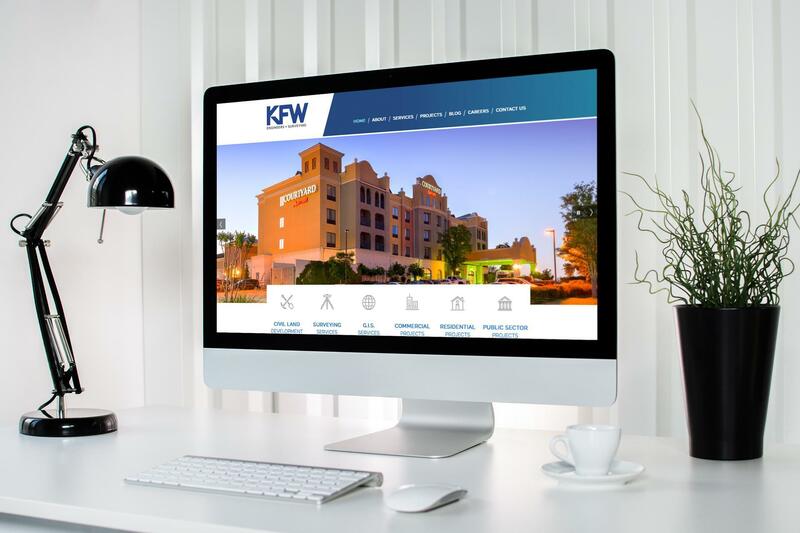 While beginning the work on their rebrand, we convinced the leadership at KFW to allow us to redesign their website. We met several times with them to make sure that we knew exactly what they needed to get out of it. They were a growing company and needed a website that would allow them to constantly update their projects, keep up a company blog, as well as post new job listings. We put together a CMS, mobile-friendly website that allowed them to keep these areas up to date themselves, without the necessity of a web developer.